Steve Almond writes about the devaluation of the music listening experience here. “See, back when I was a kid in the ’70s, the way I listened to music was pretty simple. I put an LP on the turntable, dropped the needle, then sat on the living room rug and listened to every single note. If I liked the record a lot, I would listen to it two or three times in a row, usually with the album cover on my lap, so I could study the lyrics and artwork. While the heart and soul of jazz has always been improvisation, I’m a huge fan of the pre-arranged sounds of the big band, particularly the great bands that had amazing composers/arrangers combined with incredible improvisers. If you ask any experienced and accomplished musician about practicing one thing that most will tell you is that they are now able to get more out of the same amount of practice than they were able to as a student. In part this is due to the fact that they are better musicians now and can simply move through more material faster, but this is not the only reason. Practicing, like performing, is a skill that gets better the more you do it. Since we want get the most out of our practicing we should not only be learning the art of performing, but also the art of practicing. As someone with one foot in the jazz tradition and the other in the classical I find it interesting how the etiquette for the audience is different. During a jazz performance it is considered appropriate for the audience to signal their approval of a soloist by applauding or cheering in the middle of a piece, or even just after a particularly nice moment. In contrast, during a classical performance it is customary for the audience to hold their applause until the very end of the piece. Applauding between movements will get you a dirty look and maybe even a reprimand. But historically, this was not always so. Alex Ross, of the Royal Philharmonic Society, recently gave a lecture about the history of applause. When the average person hears this [EXAMPLE: End of third movement of Pathétique] his or her immediate instinct is to applaud. The music itself seems to demand it, even beg for it. The word “applause” comes from the instruction “Plaudite,” which appears at the end of Roman comedies, instructing the audience to clap. Chords such as these are the musical equivalent of “Plaudite.” They almost mimic the action of putting one’s hands together, the orchestra being unified in a series of quick, percussive sounds. It’s commonly believed that for decades the average grade of college students have been steadily rising. While a grade of C is still defined as being the average grade, a C is really perceived by students and teachers alike as a poor grade today. Where a B was once the most common grade for college students to earn, these days more college students earn A’s. This trend in academia is known as grade inflation. The ascending perfect fourth interval has a very strong harmonic implication that can be useful for both composers and jazz improvisers (as well as being good exercises for technique development). The perfect fourth interval has the sound of a V-I (authentic) cadence. This sound is so ingrained in western music that even without any other pitches sounding we can hear the cadence when it’s set up right. 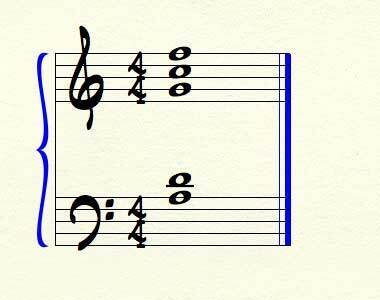 Additionally, stacking perfect fourth intervals together create a characteristic sound when used to voice out chords. One of my old teachers, Frank Mantooth, was the first person to introduce me to this concept. Voicings with only perfect fourths can imply a number of different chords, depending on what bass note sounds at the same time.